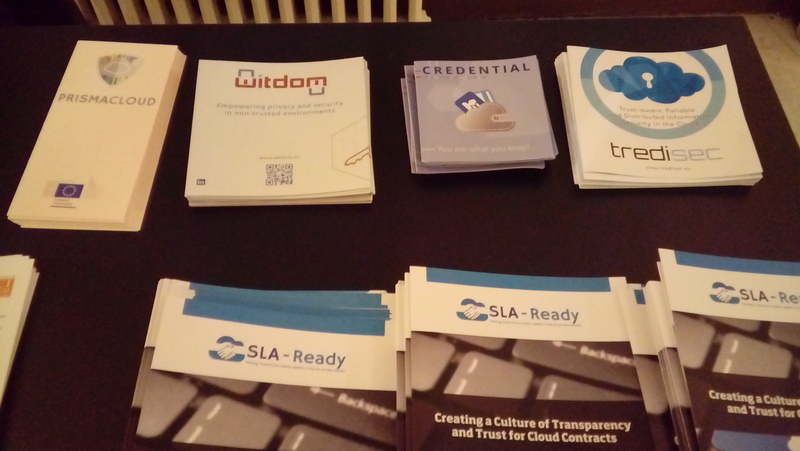 On November 14-15th 2016, Atos participated in Cloudwatch2 Cloud Security Plugfest, an event organized by CloudWatch2 project (a European Cloud observatory supporting cloud policies, standard profiles & services) in cooperation with Cloud Security Alliance (CSA) and collocated with CSA EMEA Congress 2016 in Madrid. Our project colleagues represented PRISMACLOUD at both events, where other related DPSP projects were also presented. In addition to representing a communication opportunity, the outcomes of both events are relevant to PRISMACLOUD as they respectively focus on gaining from the cloud research and industrial communities different perspectives related respectively to maximizing the adoption of and contribution to security standards in cloud projects and on addressing the current and coming changes in cloud security and privacy, where PRISMACLOUD is enabling remarkable technological advances beyond the state of the art, with high potential for beneficial impact across Europe and beyond.